Villathis property is a welcoming apartment. It sleeps three people. From Villathis property you will have a pleasant view of the garden. Villathis property is 30 square meters (320 square feet). It features a shared swimming pool, a private patio, a shared garden and winter heating. You will be approximately 800 meters (half a mile) from the center of Castiglion Fiorentino, where you will find restaurants and shops. You will find the stop for Etruria Mobilità scarl bus Cortona - Castiglion Fiorentino - Arezzo line at 100 meters (330 feet). Villathis property is located on the ground floor of a three story building. You will reach it from the parking area along a walkway that cuts through the garden. To stay at Villathis property you will need a car. You will be able to park it on the premises, free of charge inside the entrance gate. Villathis property is one of the holiday homes available in a small complex. Please find a general description of the complex below, and please scroll further down for a description of Villathis property. Villa Sandia apartments are part of a typical Tuscan style complex, consisting of 5 apartments, which is located in the heart of the Valdichiana, near the state highway that takes toward the center of Castiglion Fiorentino. The complex is surrounded by a spacious garden, consisting of several species of plants and flowers, where you will spend your time relaxing and contemplating the beauty of the Tuscan countryside. You will have the chance to refresh yourself in the swimming pool, which is located in the middle of the garden, and relaxing lying on the sun loungers enjoying the view of the greenery. The swimming pool is 6 meters (20 feet) large by 12 meters (39 feet) long, from 1.10 meter (3.60 feet) to 2.2 meters (7.2 feet) deep. The area is equipped with a table, chairs, sun umbrellas, deck chairs, sun loungers, a gazebo and an external shower. From the swimming pool you will have a nice view of the Tuscan countryside and of the greenery. You will share the pool with the other guests staying at the complex. The swimming pool is open from mid-May until the beginning of October, from 8 am to 9 pm. The garden is 3000 square meters (32300 square feet) large. It is partly shaded by trees. It is equipped with a table, chairs, a swing and an hammock. In the garden you will find a children's playground. Here you will also find a portable barbecue. From the garden you will enjoy a pleasant view of the Tuscan countryside. You will share the garden with the other guests staying at the complex, and there will be an area reserved for your exclusive use. You will be able to enter the kitchen from the garden. It is equipped with a four-burner gas cooker. There is also a small wood-fired pizza oven. The dining table can accommodate three guests. From the kitchen a double-glazed French door will take you to the garden. The room also has an arched window with a view of the garden. The patio is 20 square meters (215 square feet) large. It is equipped with a table and chairs. From the patio you will have a nice view of the garden. The furnishings of the living room are warm and welcoming. The furnishings include a divan bed for one guest. There is a nice fireplace made of stone. In the living room you will also find a cooking area. The kitchenette is equipped with a four-burner gas cooker, a small refrigerator with freezer and an Italian-style coffee-maker. The dining table can accommodate four guests. In this room you will find a television (local channels). From the living room you will be able to enter the patio through a double-glazed French door. The room has two double-glazed windows. You will be able to enter the bedroom from the living room through a brickwork arched opening. This room has no door. The bedroom has a matrimonial bed (160 cm/62 inches, wider than a queen-size bed). The room has a double-glazed small window. This bedroom has an en-suite bathroom, equipped with a washbasin, a toilet and a fully enclosed shower. 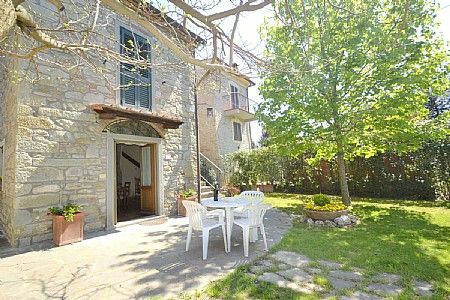 This is a beautiful 1 bedroom property located in Tuscany, Italy. This villa, in Castiglion Fiorentino, is a comfortable property sleeping 3 people. The villa offers superb accommodation, including modern luxuries such as a community pool, television and an open terrace. You can bask under the Italian sun in the villa’s beautiful garden and open terrace, making use of its great facilities.